I think I first heard that phrase on the Steve Allen Tonight Show in the early 1960's. It was a guessing game of some sort. It narrowed down the size. At that time, I had been in my Gramma's kitchen and most 1950's cabinetry had a breadbox as a drawer built into "modern" kitchens. I knew what they were talking about. Now, if we are playing a guessing game on car trips and I say "Is it bigger than a breadbox?" ...I get these open-mouthed, trying to figure ..looks from Grandkids. My own kids remember my antique store and might even KNOW how big is a breadbox. I took my grand daughters, Maya and Anna on a trip to Baldwin city, a small town that doesn't even have a square, although it sort of has a rectangle. Antiques on the Prairie Antique mall. Really, this day, we didn't find too much there. But some days, you find treasures. On the way we stopped at a couple garage sales in the country. The past 11 heat was coming, the poor garage sale people had been up since 7 and they were making deals. So Maya and Anna and I talked about deals. Both girls scored on earrings and jewelry. I bought about 100 voltive candles for $1. (ah, a winter supply!) . a Revere ware sauce pan unused for $3. A bridal veil for the costume drawer at $1. The next garage sale had nothing for Maya and Anna. But . 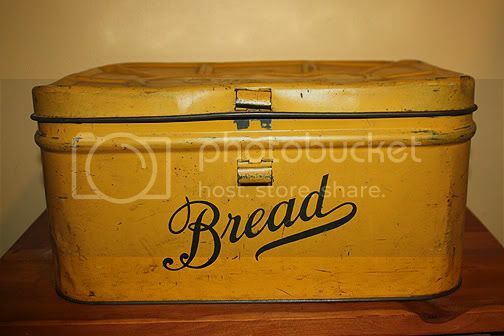 ah..for me..an old breadbox. Dented and old, it fits right into my kitchen. Currently it holds my candle supply. How big is a breadbox? About 12 by 18 inches if it is the big size. Three dollars. Maya and Anna are ready for Antique malls. Owen, not quite. But Kellar and Owen can do garage sales. I am thinking we need an all grandkid garage sale time. Might need to borrow a larger car. Never even dreamed that my junking buddies might be my own grandkids.